Taiwanese pop star Vanness Wu (吳建豪) and Singaporean heiress Arissa Cheo (石貞善) have frequently found themselves the subject of divorce rumors since their wedding two years ago. Vanness was recently spotted having fun with friends and not returning home until late at night, sparking more speculation that his and Arissa’s marriage is on the rocks. A few days ago, the Taiwanese media spotted Vanness meeting up with his friends to eat together. All of his friends had brought a female companion; Vanness was the only one without a partner. After the meal, Vanness and two of his male friends headed to a foot massage parlor, where they stayed in their private room until late at night. When asked for comment, Vanness’s record company emphasized that the incident was a private matter and would be inconvenient to discuss. However, the media questioned why Vanness appeared to living life like a bachelor when he clearly had a wife waiting at home. In the two years since they tied the knot, this is not the first time that Vanness and Arissa have avoided each other in their social get-togethers. In fact, when Arissa celebrated her birthday with some close friends in July, Vanness was notably absent from the party. When Vanness’s birthday came around in August, Arissa was out of the country attending a wedding. Vanness also failed to show up to a family dinner with Arissa’s parents, her younger brother Elroy Cheo (石正祥), and Elroy’s girlfriend Elva Hsiao (蕭亞軒). 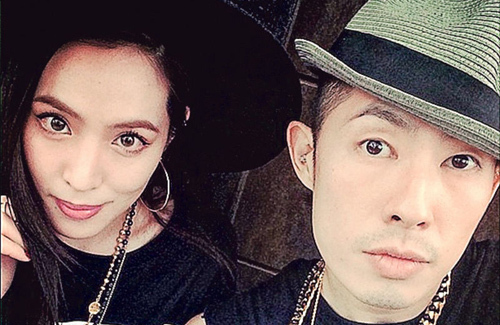 Although Vanness and Arissa made a vow in January to give their marriage a second chance, their relationship has been and continues to be a source of confusion to fans. The two often trade blows over social media, with Arissa in particular being fond of writing ambiguous posts online to hint at her dissatisfaction with Vanness. Vaness has nicely groomed eyebrows that will do any girl proud! These 2 need a course on maturity and growing up. Or just divorce – pple like that shld never have gotten married in the first place – breakup/make up/breakup/makeup oopps breakup … keep it at dating level = at least they won’t tag divorce onto the relationship. Lucky there are no kids. It doesn’t seem like Vanness Wu is paying a lot of attention to his wife…so she took matters into her own hands by passive aggressively writing about her dissatisfaction. I mean, if they were a good couple, they should’ve sat down and discussed this face to face. But somehow I don’t think Vanness is the type to relent. If both parties are stubborn and noone will back down, this relationship is doomed to fail. The only thing preventing them from pursuing this route is probably their religion and protecting their “face” from the rest of the world. They need couple’s counseling. @coralie i agree that vanness does seem to be like “ignoring” his wife but have zero respects for her for posting everything on social media. like, im starting to wonder if he is dissatisfied with her for putting all their fights pretty much all over social media. idk, not on either side. When he finally got married after being a born again virgin and openly claimed he would be good until marriage so you would think he will take marriage seriously. I also thought he’s marrying his type cuz I always feel he’s the punky type no matter how good he portrays in his tv roles and she looks exactly like his type: PARTY girl type so seems perfectly compatible from the look of it. Well well well…what do you know, i guess compatibility isn’t everything. The girl is rich so she’s probably spoiled and will not back out from anything/anyone. When you start airing your dirty laundry in social medias, there’s gotta be something wrong w/communication issues. oh well….. too bad……good luck….. Vanness Wu is still my favorite among former F4. Used to love Jerry but it seems he hasn’t had a hair cut since MG like 15 years ago? haha lol… Also, can’t they just stopping portraying the same characters over and over? Sigh…so boring to see him in the same rich dude who gets the poor girl roles. Just glad there are no kids involve for these two as it seem like they have a messy relationship!